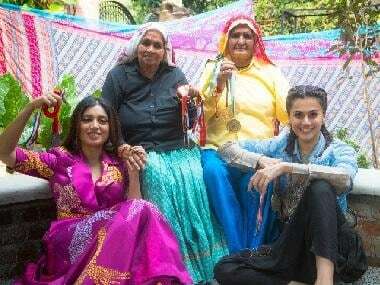 Actor Bhumi Pednekar who is currently busy shooting with Taapsee Pannu for their latest biopic Saand Ki Aankh, recently shared a video of the world's two oldest sharpshooter women, on whom the story is based. The Dum Laga Ke Haisha star took to her Twitter and shared the video of 'Shooter Dadi'. She captioned: "Daadiyan hai sabse pyaari, Harkatein hai inki nyaari. Inme hai lagan aur josh, Uda diye duniya ke hosh. #SaandKiAankh." A few moments later, the Judwaa star Taapsee Pannu also shared the story on Twitter. "Old is bold and it's an honour to portray their terrific stories that are untold. 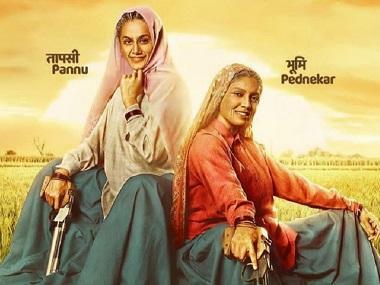 #SaandKiAankh. Come join us," Taapsee wrote. Saand Ki Aankh is being jointly produced by Anurag Kashyap and Nidhi Parmar. The film will mark the directorial debut of writer Tushar Hiranandani who has penned Main Tera Hero, Ek Villain and Half Girlfriend.